According to the Content Marketing Institute, 58% of businesses planned to increase content marketing spend in 2014. Of those companies that develop a content marketing strategy, many are seeing an increase in brand awareness, web traffic and conversion. 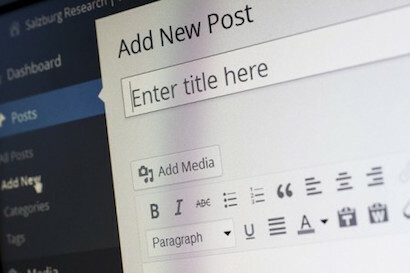 Blogging for SEO: Aside from adding new content pages to your own website, blog writing is one of the ways that your company can take advantage of this content marketing trend. Many companies are now building their websites on blogging platforms such as WordPress because of the ease of use for publishing new blog posts and the tools available for enhancing social media and SEO. If you use SEO tools such as the one provided by Google AdWords to research and create your blog posts and topic ideas, you can tailor your blog posts toward the most popularly searched keyword phrases in your industry. Having a blog writer who understands SEO and can write effective blog content using targeted keyword phrases can make a difference in your inbound lead generation through search engines. Here at Hubstaff, we’ve also experienced positive results from our blogging efforts. Since our company began implementing our content marketing strategy, the Hubstaff blog has experienced a 215% increase in website traffic. This strategy has resulted in increased inquiries and lead generation for our employee time tracking software, as well as our development, design and marketing staffing services. Readers are greatly influenced by blogs before making a purchasing decision. Blogging positions your company and thought leaders as experts in their respective industries. By offering your readers fresh blog content, you can help them solve a problem, understand a concept, or even just entertain them. Then, when the time comes to make a purchase decision, your company will be top-of-mind in their eyes. According to the LeadersWest Digital Marketing Journal, 42% of consumers look to blogs for purchase decisions and 52% say that blogs have impacted their purchase decisions. Blogging can also help improve your social media presence. By developing content on your blog, you can drive traffic to your Facebook, Twitter, Google+, LinkedIn and other social media pages by sharing your content on social media. This, in turn, will create visibility for these posts, and if the content is valuable, your followers will share the link to the post with others, thus increasing your fan base and driving traffic to your website. Think about the last time you did a web search on a particular topic. Whether your search was for information or you were ready to make a buying decision, many of the search results you will find will contain content from a blog post. Google values fresh, original content on a particular topic, so, if you do it right, blogging can help boost your organic search results for your desired keyword phrases. What to blog about? At Hubstaff, we use our blog to educate our web visitors about things that are important to their business. Since we are a software company, we blog about the benefits of time tracking and other software that improves efficiency in an organization. We use our blog space to further explain our Hubstaff software and ensure that our customers understand how to use it, and how it integrates with other financial and project management software. Our team also blogs about business issues that relate to our product and service offering, such as the importance of outsourcing, how to create virtual teams, how to improve productivity, and marketing your business more effectively. When you are creating a content marketing strategy for your business, keep in mind the topics and issues that are most important to your customers, prospects, partners and even the media. Develop a content marketing strategy that includes a running list of ideas for future blog posts. As you encounter new data, trends or customer concerns, add these ideas to your content list. When you need to write a new blog post, refer to this content topic list and use it to prioritize which blog post topic to choose. Finding a Blog Writer: While some companies may have an in-house writer or marketing person who can handle blog writing and developing custom content, many smaller businesses cannot afford a full-time person dedicated to article writing and blog content. In that case, we recommend outsourcing your blog writing to a professional who can work directly with you to develop a blog content strategy and write your blog for you. Outsourcing lets your team focus on what they do best. If you are currently having an administrative professional or sales assistant handling your blog writing or content development (or perhaps doing it yourself), you are limiting the time these individuals can spend finding and serving your customers. This will eventually negatively impact your business. Outsourcing blog writing gives your writing an objective viewpoint. Sometimes it’s hard for companies to view their business as others perceive them. Having someone outside the firm blogging for you gives you that fresh perspective that may be lacking in your current writing. Your outsourced blog writer might also have better insight into the customer’s mindset, since they are more removed from it than your employees. Outsourcing is more cost-effective than hiring internally. Although you may be paying more per hour or per post for a professional blogger, outsourcing your blog writing will save your company money because the blog writer is generally more adept at writing and editing, and can produce a quality blog post in less time than someone on your team might spend doing the same thing. In addition, you’ll avoid paying the overhead and expenses of a full-time employee. Professional bloggers can improve your results: Using an outsourced blog writer who understands marketing strategy and SEO means they can likely do a better job of researching the ideal blog topics, and writing in order to drive traffic through your corporate blog. If you don’t have an in-house writer with SEO talent, you’ll likely be better off hiring a content marketing agency or professional blog writer to do your blogging. Stop waiting around for the web traffic to arrive. Once you develop a content marketing strategy and push content to your blog, you’ll drive more traffic to your website than you can imagine. Let us know if we can help you find an expert writer to guide you through this process. Get your blog writing expert on an Hourly Basis.